The patients often find themselves in situations where they have a very brief interaction with doctors, narrating their problems and the doctors handing over them a prescription of medications. We fill this gap of collecting superficial information while imbibing the maximum information from the patients as we engage deeply and spend quality time with patients and seekers come to us. We do the complete 8 folds or ‘Asth Vidh’ examination of our patients so that there would not be any chance of skipping any important details of the conditions troubling them. This process enables us to evaluate the signs, symptoms and severity of the conditions in great details. Based on the evaluation of condition/s, the next step is to identify the cause/s of the condition/s. According to Ayurveda, there can be one or multiple causes of the diseases and it ranges from aggravation of doshas in the body to any lifestyle issue. At ‘AAS Ayurveda’, a great deal of time is spent on the education of patients describing as what happen to them, how it happened, and what line of treatment is best suitable for them keeping their body constituents in consideration for speedy benefits. Every human being has a unique psychosomatic constitution called ‘Prakarti’ in Ayurveda. 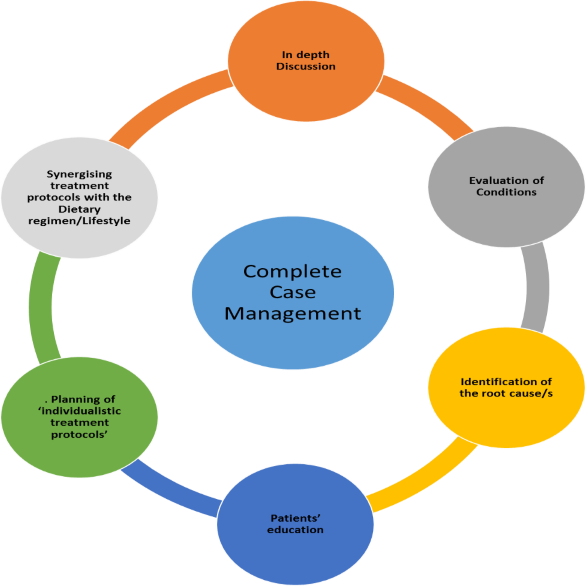 The concept of this unique body constitution forms the basis of designing ‘Individual Treatment Protocols’ for our patients. The entire treatment protocol serves well in sync with the patient’s age, body’s constitution, severity of the medical conditions and other personal details. We design and synergize the Individual Treatment Protocols for every patient who seeks our consultation and this includes not just a prescription of medications but a complete health plan that has best Dietary Regimen, Lifestyle Management plan for the patients during the course of treatment, in convalescence phase and a complete guide to live a healthy life ahead.